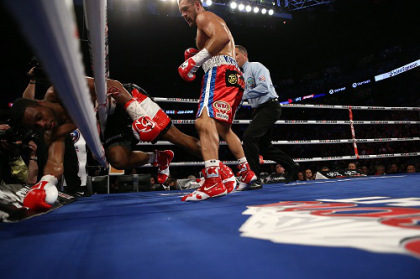 Read With Malice Aplenty: Sergey Kovalev TKO8 Jean Pascal on The Cruelest Sport. Entertaining fight, moment of the year so far is surely Kovalev pointing at Pascal and laughing with his corner, ‘I got this’. That guy hits damn hard. He’s a frightening individual. That a guy who killed someone still fights with that kind of ruthlessness is almost unheard of. Very very true, he hasn’t lost his edge or ability/willingness to be clinical one bit, which is quite remarkable when you compare it to other fighters who experienced similar. I’d love to see him handle a dangerous guy like Stevenson. But while I tried to hold of on claiming Stevenson ducked him, it’s become pretty clear that Adonis wants nothing to do with anyone who is actually a threat. He’ll probably milk his relationship with Haymon, and then ride off into the sunset.